To meet the challenges of the 21st Century, Hong Kong is in need of versatile talents and school education is a deciding factor in the success of nurturing such talents. Hence, in supporting schools in the implementation of the recommendations made by the Education Commission in Learning for Life, Learning through Life – Reform Proposals for the Education System in Hong Kong (2000) and in the Curriculum Development Council (CDC)’s note report Learning to Learn – The Way Forward in Curriculum Development (2001), the Basic Education Curriculum Guide – Building on Strengths (Primary 1 - Secondary 3) was published by the CDC in 2002 and the curriculum reform was launched in the same year. The direction of the curriculum reform is to provide comprehensive and balanced learning experiences for students. In addition to acquiring knowledge in class, students are expected to develop learning to learn capabilities as well as positive values and attitudes for achieving the educational aims of whole-person development and life-long learning. Based on the feedback collected, the recommendations in the Basic Education Curriculum Guide (2002), including the learning goals and the curriculum framework have been highly recognised. Today, we are delighted to see primary schools responding to the curriculum reform positively and developing their school-based curriculum steadily. Some of them have even formed cross-school communities to enhance their whole-school curriculum development by strengthening their professional capacity and making effective use of resources, and their efforts and achievements deserve recognition. Looking back on our work in curriculum development for over a decade, we would like to extend our heartfelt gratitude especially to all colleagues in the primary education sector. They have been working tirelessly and demonstrated professionalism and team spirit throughout the reform. They have successfully nurtured students with different potential and laid the foundation for whole-person development. However, since the curriculum reform started, the world around us has changed rapidly. This is evident in the growing multiplicity of social values, the increasing attention to collaboration and interpersonal skills, the integration of technology into life and study as well as the diversity in students’ backgrounds. Through the school curriculum, we hope our younger generations do not only care about their own well-being, but also adopt a global perspective and become contributing members of society, the nation and the world. We have pledged to review the 10-year curriculum reform, and in conducting the review, we have conducted different types of evaluation studies and surveys, and published A Mid Term Report on Curriculum Reform to School Heads and Teachers in 2008. To sustain our curriculum review on the basic education, feedback on the “Learning to Learn” reform has been collected extensively from stakeholders through various channels, and reference has been made to international and local research findings in updating the parts of the Basic Education Curriculum Guide – Building on Strengths (2002) related to primary education to address the latest development in society and needs of students. Building on the practical experiences and fruitful outcomes of the development of the primary school curriculum, schools are recommended to sustain school-based curriculum development by building on their existing strengths. 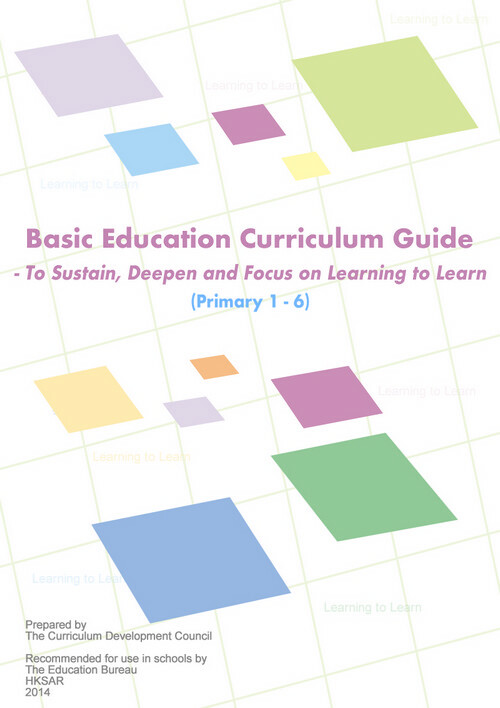 The updated version of the Basic Education Curriculum Guide - To Sustain, Deepen and Focus on Learning to Learn (Primary 1 - 6) aims at reiterating the overall aims of the school curriculum and the framework developed by the CDC in 2001 and providing recommendations on the sustainable development of whole-school curriculum planning, the four key tasks, learning and teaching strategies, resources and assessment. It also provides more exemplars on effective learning, teaching and assessment strategies for reflection and reference of curriculum leaders and teachers in primary schools, thereby helping schools to focus on learning and teaching effectiveness, deepen the positive impact of the curriculum reform as well as sustain the quality of learning. The Education Bureau will continue to provide schools with professional development programmes, learning and teaching resources and support services, keeping up with the latest development in the primary school curriculum. The success of the curriculum reform hinges on the support from different sectors of society and the collaboration of colleagues in primary schools. The updated Basic Education Curriculum Guide - To Sustain, Deepen and Focus on Learning to Learn (Primary 1 - 6) has now been uploaded to the EDB website for public access. We encourage schools to adopt the recommendations set out in this guide, where appropriate, with due consideration to school-based needs, situations and strengths. We also encourage schools to continue to improve the curriculum to achieve the aims of education and the school curriculum to nurture the future leaders of society and the nation. Different from past practice, printed copies of this curriculum guide will not be distributed to schools. As curriculum development is a continuous process of improvement, the web version will facilitate timely updates of the content and exemplars, and allow flexibility in use. In this connection, we look forward to receiving your valuable professional views on how to leverage the strengths of schools and address students’ needs with a view to pooling wisdom for further improvement of the curriculum. Note： The Curriculum Development Council is an advisory body giving recommendations to the Hong Kong Special Administration Region Government on matters relating to curriculum development for the school system from kindergarten to Secondary 6. Its membership includes school principals, teachers, parents, employers, scholars, professionals of related sectors, representatives of the Hong Kong Examinations and Assessment Authority and the Education Bureau.